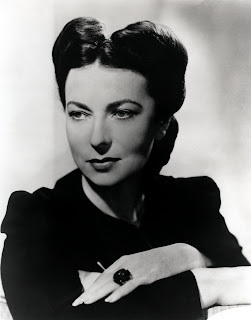 The dramatic serial offered numerous women a lucrative income that grew with their wide variety of dialects and voices: Elsie Hitz, Elsie Mae Gordon, Agnes Moorehead and Peggy Allenby, to name a few. The role of Margot Lane was interpreted by at least 10 actresses. Attractive, intelligent, well educated, and generally demonstrating pretty good common sense, Margot somehow, nine times out of ten, wherever she goes, encounters some kind of monster, mechanical man or plain crackpot lurking in the vicinity. There was one occasion when she got mixed up with a mad scientist, and in no time at all, he was preparing to exchange her vocal chords for those of a cat. 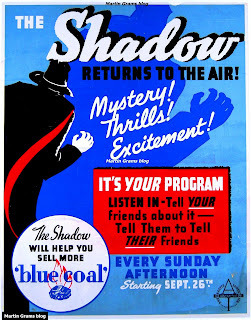 The Shadow saved her from that with only two minutes to spare — and those, of course, had been reserved for the sponsor’s sales talk. 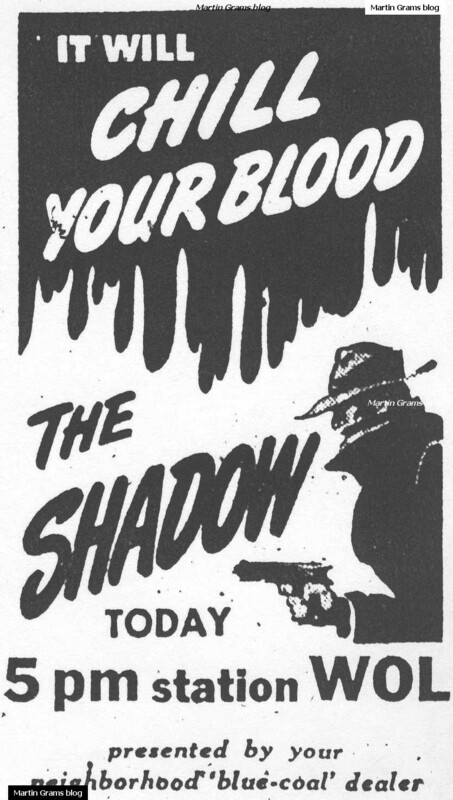 Display banner for The Shadow program. Armed with an independent spirit, Margot joined Lamont on numerous adventures as an invaluable assistant who rarely questioned his motives. On uncommon occasions she suffered wounds in the line of duty, such being hypnotized into suffering a series of murderous nightmares in “The Dreams of Death” (April 28, 1946) and scars from a gas explosion in “The White Witchman of Lawaiki” (May 5, 1946). In “The Mark of the Black Widow” (October 27, 1940), a homicidal maniac was doing a very successful business with poisonous spiders encased in gelatinous pellets. He would secretly deposit one on his victim and after body heat melted the substance, the spider was free to take a bite, and that was that. In Margot’s case, the clever fellow was less subtle and had just decided to dispense with the gelatin when the ubiquitous Cranston arrived to go into his “Shadow” act with the usual effect. The poor fiend lost his wits completely and died a horrible death. In the episode “Murder Incorporated” (December 17, 1939), she was described in the newspapers as a “prominent society girl.” Her means of income was never disclosed throughout the series, but a brief mention that she had “investments” was made in one episode during the early fifties. A shopaholic, she often purchased trinkets and items that were overpriced, on occasion driving Lamont into a fit of concern though he never questioned whether she could afford it. She had a weakness for hats; one of her purchases led her and Lamont on a mystery during Easter Sunday. 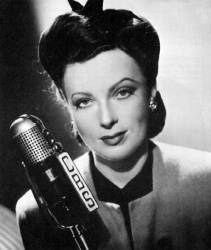 The January 26, 1941, issue of PM Weekly described her as “a nimble-witted, Café Society number designed on [1930s debutante] Brenda Frazier lines.” George A. Mooney of the New York Times once described her as being 26 years old, but her true age was never disclosed on the radio program. What little we do know comes from close observation of the radio broadcasts. Margot attended City College (nickname of City College of New York), as evident in “The Chill of Death” (February 1, 1953) when she reminds Lamont that she flunked chemistry. 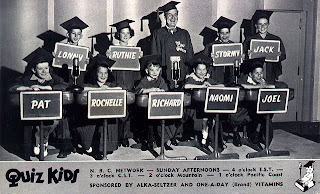 Another mention that Margot attended college was in “The Mad-Dog Murders” (August 17, 1952). Margot evidently smoked cigarettes — almost as much as Lamont. In “The Headsman of the Camerons,” (September 28, 1941), she not only excuses herself for a second to put out her cigarette, but the stub later verifies to Lamont that she was on the premises when others insist they never saw her. Her lipstick was found on the cigarette stub. Margot gave Lamont a gift in the form of a cigarette case in “Murder Deferred” (March 22, 1942), which later deflected a bullet meant to kill him. A cigarette case also saves Lamont’s life in “Assignment With Murder” (October 5, 1941). In “The Four Giants of Amsterdam” (November 25, 1945), a small town in the Midwest suffers a series of brutal murders and a dead man returning from the grave. Frightened by the events, Margot asks Lamont for a smoke to settle her nerves. She also smokes a cigarette in “The Ghost of Caleb MacKenzie” (January 26, 1941). 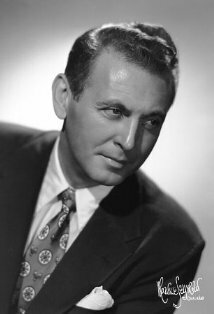 Lamont attempts to solve a mystery involving Rodney Serling, suffering from amnesia and bent on clearing his name for a murder he may — or may not — have committed in “The Lost Mind of Death” (June 25, 1950). At the end of this episode, Margot discovers she was sent on a wild goose chase when Lamont asked her to find a unique water fountain on the grounds of the sanitarium. “Well, to tell the truth, Margot,” Lamont explains, “I… well, I was afraid it might be dangerous for you in the sanitarium, so I… well, I sent you on an errand just to keep you out of the way.” Angry, Margot questions her own sanity for trusting him. “This girl is going to come to her senses,” she threatens. The script originally called for Margot to remark, “I could beat your head in, you… you cheat.” But the line was scratched out and replaced with a more friendly closing comment. MARGOT: I’m going in with you. MARGOT: As a mule, Commissioner. 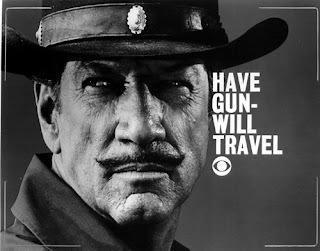 That’s what my father always said. The question of the Cranston-Lane relationship was modestly suggested by the announcer in the beginning of every broadcast — except the initial 26 episodes. 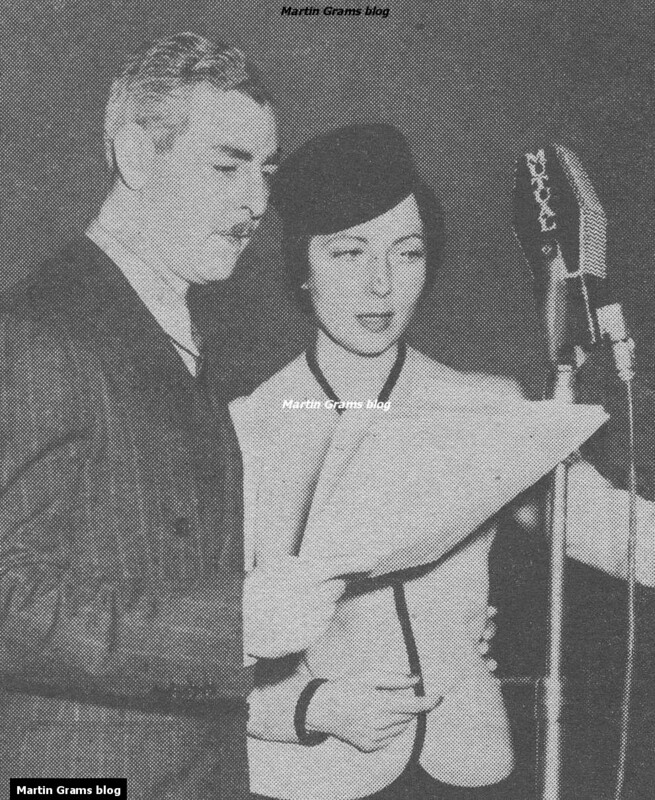 It was not until the first episode of the Goodrich series, “The Hypnotized Audience,” that she was introduced as “…constant friend and aide, Margot Lane…” This same introduction continued through to the 1938-39 Blue Coal season until “The Isle of Fear” (October 30, 1938) when Margot was “. 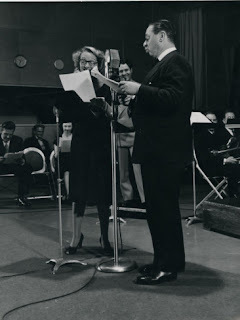 . . friend and companion, the lovely Margot Lane.” This became the standard through June 4, 1950, when the D.L.&W. 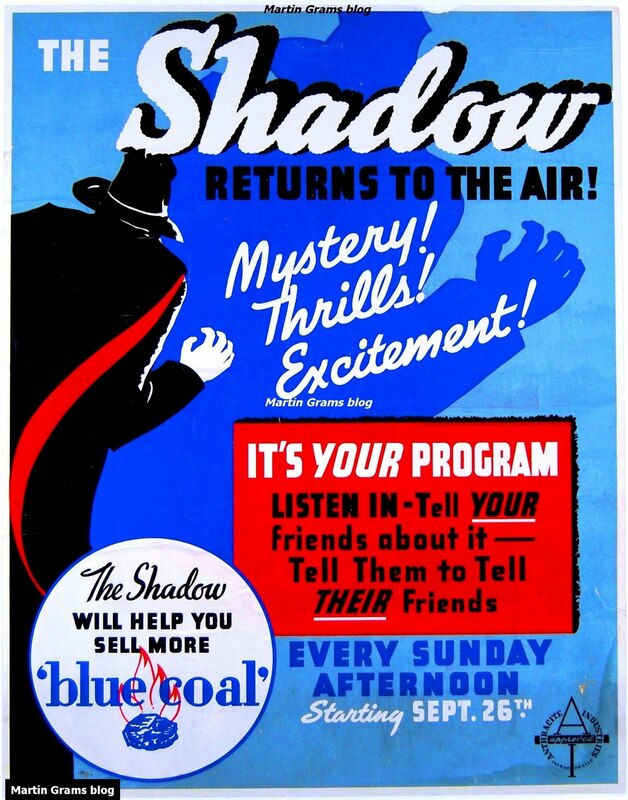 Coal Co. ended its two-decade relationship with The Shadow. Beginning June 11 and running till the end of the series, Margot was simply “…Cranston’s friend, Margot Lane.” “Friend and companion” did not go overlooked by the adults who heard something more. The second script for the series, “The Red Macaw” (October 3, 1937), scripted by Edward Hale Bierstadt, established the relationship between Margot and Lamont. Shortly after completion of the script, it was decided to move that scene to the season premiere, “The Death House Rescue” (September 26, 1937), where it remains today. All through the scene, Margot attempts to encourage Lamont to drop The Shadow identity and live a life of normalcy. MARGOT: I’m serious, Lamont Cranston. When I foolishly let you know that — do you remember what you said? It will be exactly five years next week. LAMONT: But there’s still so much to do, Margot. MARGOT: Well, then let somebody else do it. Don’t you realize that you can’t keep on like this forever? Someone is certain to identify you and when that someone does, that someone else is certain to kill you. LAMONT: Perhaps, but until they do… Oh darling, stop frowning. MARGOT: I don’t necessarily mean for you to give up your work, Lamont. But this ‘other’… let the Shadow just disappear and come out openly. You and the organized forces of law and police. LAMONT: Don’t you realize Margot, my entire usefulness to the organized forces of the law and police lies in my remaining outside those forces. Remaining always as The Shadow. Would they approve my methods? Would they believe in my science? MARGOT: You would make them believe. You could make them approve. LAMONT: And in doing so revealing my secrets. My knowledge. Reveal them and eventually let them fall into the hands of organized crime. No Margot, no one must ever know. No one but you. In the third episode, “Danger in the Dark” (October 10, 1937), Margot makes a second effort by confessing her love for Lamont and pleads for him to call off his Shadowy escapades. MARGOT: Oh Lamont, why do you take these chances? Won’t you ever give it up — this masquerade as The Shadow? MARGOT: Then perhaps — you could settle down — and be like other people. We might even — oh, I don’t know. LAMONT: You mean — get married? Throughout the remainder of the series, their relationship is not given significant exposure, leaving the scripts to focus on Cranston’s deduction and investigative skills to thwart criminals. To diminish any hint of a sexual relationship, Lamont and Margot never slept together in the same room no matter what the situation. In “The Giant of Madras” (May 16, 1948), Lamont and Margot are passengers on a deluxe transcontinental train, and they slept in separate berths, Lower 10 and Lower 11. In “The Loom of Death” (July 1, 1951), Lamont attempts to solve the case of a horrible burning and hissing emanating from a tapestry depicting the frightful curses of Satan. On a train bound for the origin of the radioactivity that causes the phenomena, Lamont and Margot sleep in separate compartments — Compartments 10 and 12. In “Ghost Town” (October 6, 1940), Lamont checks into a hotel and asks Mr. Evans to have their rooms (plural, not singular) on the same floor of the hotel. Back home, listeners who paid careful attention knew that both Lamont and Margot resided in separate apartments. When D.L.&W. 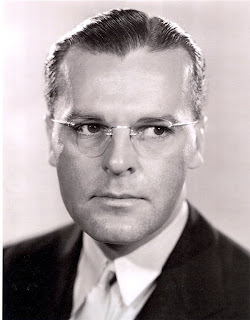 dropped sponsorship, producer and director John Cole made room for Harry Ingram, who supervised the productions with a change of direction in Lamont and Margot’s “modest” relationship. When Lamont introduces Margot to the shady Manuelo in “Corpse in a Straw Hat” (June 18, 1950), he struggles while searching for the right description to refer to Margot as more than his lady friend, and Manuelo interrupts before Lamont finds a word. RUTH: But - we’re not important. MARGOT: Every human being is important, Mrs. Adams. Lamont Cranston knows that. RUTH: He must - love people very much. MARGOT: He does - love people. (ACID) In the plural. The same episode closes with Lamont purposely avoiding the subject of matrimony — a complete change of character from the Orson Welles version. LAMONT: They’re a nice couple. MARGOT: Ruth and Joe? Wonderful. LAMONT: They’ll have a good life. I envy Joe. MARGOT: (HER BIG CHANCE) You mean - because of his wife, and his home? MARGOT: But Lamont — you can have them. (SO SOFT) If you want. LAMONT: (TRAPPED) Well, I — I — (THEN SUDDENLY) No. I can’t. I can’t have Joe Adams’ wife and home. LAMONT: Because, Margot — (LAUGHS TEASINGLY) They’re his. On two occasions, however, Margot did receive a favorable response at the conclusion of their adventures — both holiday offerings. In “Out by Christmas” (December 24, 1950), after helping clear young Jimmy and Patty Ryan’s father from a murder charge so he can return home to his children in time for Christmas, Lamont and Margot celebrate in the Ryan home. MARGOT: (HUSKILY) You did it. Out by Christmas. MARGOT: A good job of earning your four dollars and eighty three cents. LAMONT: Do I get a bonus? MARGOT: What do you mean? LAMONT: From you. After all, it’s Christmas. JIMMY: (COMING IN) Say, there’s some ice skates under the tree. Isn’t Christmas swell? Gee, I wish it’d come every day in the year, don’t you? MARGOT: I certainly do, Jimmy — I certainly do. In “Murder by Midnight” (December 31, 1950), Lamont attempts to start the new year with a bang when he organizes papers that will convict Lefty Benay, head of a dope ring. Margot forces Lamont to attend a masquerade party, unaware that Benay arranged for an actor who looks and sounds like Lamont Cranston to remain masked during the ball so the crooks can kidnap the real Lamont. Forcing the handcuffed Lamont, Lefty applies whatever tactics he can to make the detective reveal who in his organization leaked the information Lamont has gathered. Lamont becomes invisible, but Lefty isn’t fooled into thinking he has run away, realizing he now knows the identity of The Shadow. Giving chase on a winding road, the crooks attempt to run Lamont over. The car goes out of control and over a cliff, and they are killed instantly. Meanwhile, Margot discovers the ruse when the fake Lamont gets romantic and actually kisses her. She waits for the real Lamont to arrive and take her home, and the episode closes with her standard disgust for his lack of romance. MARGOT: I knew that man couldn’t have been you. He paid me compliments, he got me out in the moonlight — he even started to propose. CRANSTON: He did? Good Lord! That’s terrible. MARGOT: Brand new year — same old Lamont. After saving another innocent from an unwarranted charge by exposing a numbers racket in “The Doll With Yellow Hair” (December 23, 1951), Lamont and Margot gift wrap a doll with yellow hair for the man’s daughter and arrange for him to get a new job starting the day after Christmas. Alone in her apartment, Margot attempts to take advantage of the holiday fever pretending to be the same little girl to whom they’ll deliver the doll. MARGOT: (SOFT) Hey, Mr. Cranston — you know something, Mr. Cranston? MARGOT: You’re a pretty nice kind of a type fella. LAMONT: So’s Santa Claus. The old gentleman gave me the steer I needed in this case. MARGOT: That’s just peachy and I’m real grateful to him, but the old gentleman doesn’t happen to be here right now. MARGOT: He’s not here, but I am. LAMONT: Oh — I see what you mean. (SOFT) You’re a very forward girl, Miss Lane. MARGOT: You’re a very backward lad, Mr. Cranston. LAMONT: (COMING OUT OF IT. WEAKLY) Merry Christmas, darling. MARGOT: (THREE FEET OFF THE GROUND) Oh, Merry, Merry Christmas! Consistency was not established in any form of guidelines for the scriptwriters. 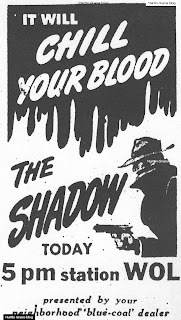 The producers and directors of The Shadow oversaw the content and made revisions when necessary, but with the changing of the guard over the years, continuity was sure to be off-centered. In “Death Prowls at Night” (March 23, 1941), Margot is kidnapped by a hypnotist from Central Europe who turns out to be a werewolf. Lamont, questioning the locals on Margot’s whereabouts, describes her as five-feet, five-inches tall, weighing 118 pounds and having brown hair. In “The Three Queens of Death” (November 13, 1949), a painter determined to complete a masterpiece murders his models so they can pose properly for the canvas. 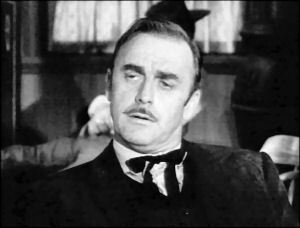 After murdering a redhead and a brunette, he sets his sights on Margot, described as “a golden, blue-eyed, blonde.” In the episode “The Wig Makers of Doom Street” (November 28, 1948), wig makers selling their product to a dealer in illicit merchandise stop kidnapping and killing blondes for their hair and center their attention on a brunette. Margot would have been their final victim if it weren’t for the interference of The Shadow. In the episode “House of Fun” (October 22, 1939), Lamont remarks that Margot is a spitting image of Dorothy Andrews, described as blonde, medium height and slender. In “The Death Ride” (February 27, 1944), a friend named Cora asks Margot if she wants any sugar in her hot chocolate. Margot thanks her but rejects the sweets. “How I envy you slender people,” Cora remarks. In “The Girl and the Doomed Tiara” (January 29, 1950), two criminal geniuses named Claude and Mary, involved in a theft and murder, find a young lady suffering from a temporary amnesia and convince her that she is an escaped killer. Margot Lane is twice referred to as a blonde by Mary in this episode. Lamont Cranston admitted he was an animal lover, but never had a pet of his own. Margot, however, received a puppy as a Christmas present from Lamont in “The Stockings Were Hung” (December 24, 1939). She had a pet cat in “The Man Who Dreamed Too Much” (November 19, 1944) and a Cocker Spaniel named Brownie in “The Curse of the Cat” (January 20, 1946). In “The Case of the Red-Headed Corpse” (July 5, 1953), Margot’s dog, Caesar, had recently been returned from dog college. Margot’s family members were featured on rare occasion. The first was “Murder By The Dead” (October 17, 1937) when murderer Peter Swift apparently returns from the gallows to seek vengeance on the men he felt were responsible for his conviction. 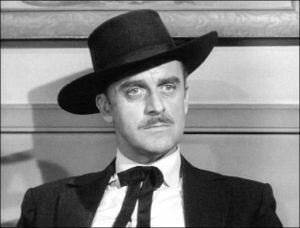 Margot’s father, Ross Lane, was the jury foreman on the case and is targeted by Swift, making the matter more personal for Lamont and Margot. Her mother never makes an appearance in the series, but in “Halloween in Vermont” (October 29, 1944), her mother’s name is revealed: Helen Lane. Helen apparently had sisters. Margot had a number of aunts, and on occasion paid them a visit — they all lived north of New York City. In “Halloween in Vermont,” Margot’s Aunt Emma resided on a small farm on Baldtop Mountain. In “The Witch Drums of Salem” (summer of 1938) Lamont and Margot venture through New England to meet Margot’s Aunt Henrietta in Maine. In “Dragon’s Tongue Murders” (October 12, 1941), Oriental mysticism pervades a country weekend when three potential murderers gather in an effort to appropriate a fabulous emerald. During their investigation, Margot tells Lamont that her Aunt Augusta attended Vassar. Killer” (December 21, 1952). 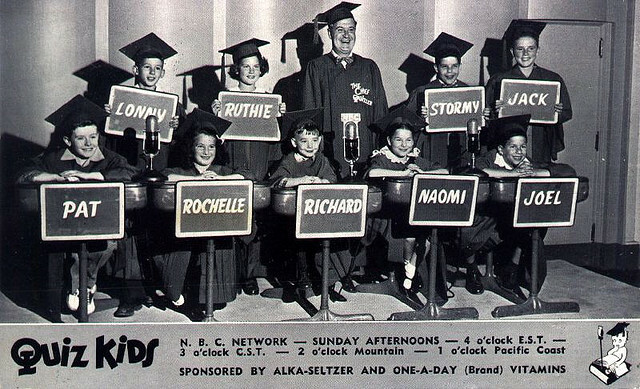 As the announcer explains, “Christmas comes but once a year and Margot and Lamont, each with young nephews and nieces to shop for….” Two of the nieces are mentioned by name — Susie and Debbie. In “The Hiss of Death” (February 24, 1946), Margot’s new maid, Angie Patrini, plays an important role. Angie is a member of a snake-worshipping cult and though it was thought harmless at first, Lamont uses Angie as a means of uncovering the truth — the leader of the cult killed members who were also faithless wives as his twisted way of revenge. 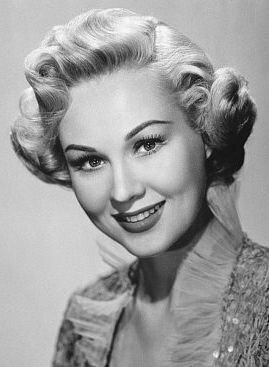 Mary Granger was described as Margot’s former secretary in “The Lost Dead” (December 19, 1948) and “Death and the Twin Cadavers” (October 18, 1953). 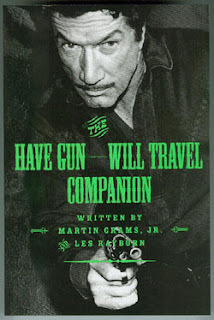 The second production was a repeat performance of the 1948 script, simply re-titled. 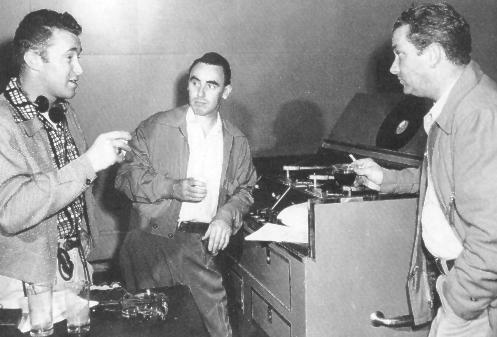 It has become an annual tradition for old-time radio fans to listen to the 1938 "War of the Worlds" panic broadcast on Halloween Eve. After listening to the broadcast more than a dozen times, it still surprises me that I catch something I overlooked the prior times, from bloopers to historical references. This year, however, I made the trek to the Grover's Mill Coffee Roasting Company, inspired by the 1938 panic broadcast. Four years ago, I joined my good friends Neal Ellis, Ken Stockinger, Dr. Mike Biel and his daughter Leah Biel, to Grover's Mill, New Jersey, the real-life town where the fictional Martians invaded. Visiting the supposed landing site is like a Civil War buff touring the Civil War battlefields. 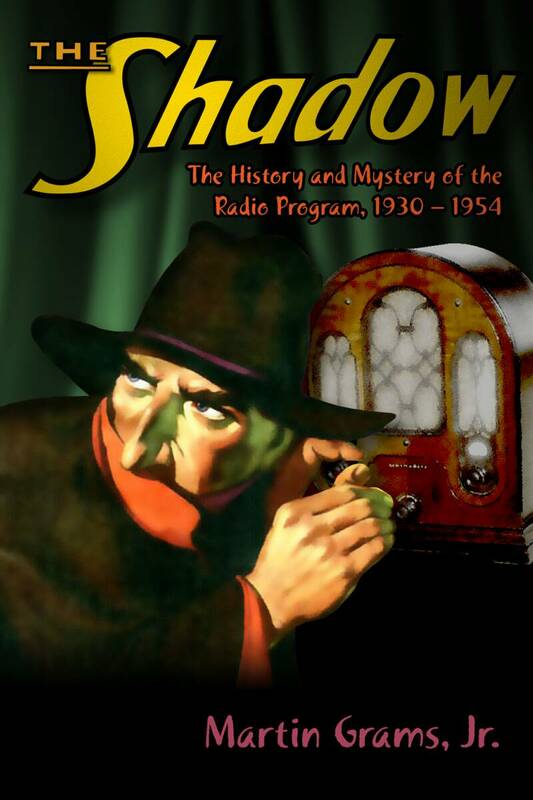 After talking to locals and discovering new facts behind the broadcast, the significance of Orson Welles' 1938 broadcast has more meaning today than it did when I was a kid. Bronze monument at Grover's Mill. 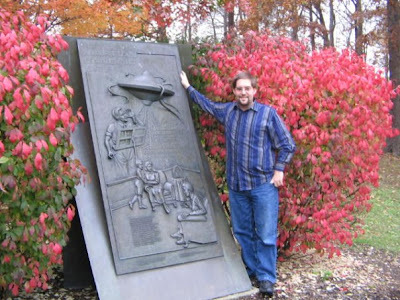 On October 29, 1988, the citizens of West Windsor Township dedicated a monument to the memory of the Martian Invasion. The bronze monument depicts a skyscraper-high Martian war machine in the upper right corner; in the left center, a brilliant, twenty-three year-old Orson Welles stands in front of a microphone; and in the lower two-thirds, a fairly typical American family listens to the radio broadcast. It not only reminds us of the broadcast that panicked Americans but also recalls the fateful night when America lost its innocence. Naturally, we went there to visit the monument, located a few miles away from the coffee shop. We were shocked to learn, during our first visit to Grover's Mill, that tourists flocked to the memorial every Halloween, but after the 50th Anniversary of the broadcast, interest has diminished and rarely does anyone come by to check out the memorial, or question the local citizens about the Martian scare. This is dis-heartening, but a fact of life as the fan base continues to age. Supposedly during the night of the Martian scare, locals unfamiliar with the territory, took pot shots at the Martian machine that roamed the city. In reality, what they shot was the water tower which was found, weeks later, to have buckshot inside. One of them was a farmer, Bill Dock, who admitted afterwards that he was among the people who took aim and fired at the outer space intruder. It didn't take long for Life magazine to pick up on the story, and asked Mr. Dock to pose for their camera (pictured below). Bill Dock posing for a photographer of Life magazine. The end result was that many of the locals in Grovers Mill wouldn't talk to the press. When Ken and Neal wandered about Grovers Mill a few years ago, they discovered some of the locals still won't talk to people about it! More amusing, they found the mill (pictured many times as a local landmark around the corner from where the monument is) which is where Mr. Dock posed for the photographers. The owner of the mill would not talk to us about the Martian scare, initially, until he was convinced we were historians and then opened up about the local tourist attractions. On the plus side, a recent visit on the anniversary, October 30, 2011, sparked an attempted revival from Franc Gambatese, originally from Patterson, NJ, owner of the Grover's Mill Coffee Company. Franc and his wife have been in the coffee business for seven years and three years ago opened the Grover's Mill Coffee House and Roastery, located at 295 Princeton Hightstown Road, Southfield Shopping Center, in West Windsor, New Jersey. Every year on the weekend of the "War of the Worlds" anniversary, they organize a celebration which includes re-creations. 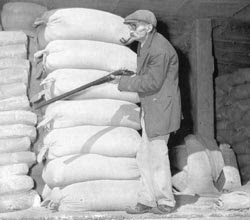 "We're deadly serious in the coffee business, as much as we are in preserving Grover's Mill," Franc told me. "Our place has become a museum and all of the donations originate from other people. They've even given us radios. People seek us out and make donations and we put them on display for everyone." Martian machine made of coffee pots. Whether it was a Martian war machine made out of coffee pots or an original newspaper from 1938, the most impressive display was an original painting by Robert Hummel, created in 2008 specifically for the coffee shop. "I know Robert as a friend and I saw him one day and told him we were opening a coffee house and asked him to make a contribution. We gave him an old coffee pot and he used it as the model of the Martian machine. What he did was wonderful. Robert even has copies of the painting available on his website." Photos on display at the Grovers Mill Coffee Shop. During an interview on Radio Once More, broadcast live from the coffee shop, we learned that Franc also wrote a thesis about Orson Welles and the "War of the Worlds" panic broadcast, while attending the William Paterson College. His passion for the "War of the Worlds" broadcast was clearly evident (though he remarked that his wife was the brains behind the business). They offer tee shirts, DVDs, CDs and books for sale, all related to the panic broadcast. The crew of Radio Once More broadcasting live. Anyone who came in with a costume got a free coffee. The coffee shop not only offers a museum of artifacts from posters, models and autographed photos, but some great coffee and tea. During our visit, they served Martian Moca Java. Turns out they have their own specialty blends, which are really good. I'm not a coffee drinker, so I chose the caramel apple cider and it was fantastic. If you are looking for something different to do next Halloween, why not consider visiting the Grover's Mill Coffee House & Roastery in New Jersey next year. You won't regret it.